MITCHELL, Parren James, a Representative from Maryland; born in Baltimore, Maryland, April 29, 1922; attended Baltimore public schools; A.B., Morgan State College, 1950; M.A., University of Maryland, College Park, 1952; served in the United States Army, Ninety-second Infantry Division, commissioned officer and company commander, 1942-1945; received Purple Heart award; professor of sociology and assistant director, Urban Studies Institute, Morgan State College; executive secretary, Maryland Human Relations Commission, 1963-1965; director, Baltimore Community Action Agency, 1965-1968; supervisor, probation work, Supreme Bench of Baltimore City, 1954-1957; president, Baltimore Neighborhoods, Inc., 1969-1970; delegate, Maryland State Democratic convention, 1972; delegate, Democratic National Convention, 1972; elected as a Democrat to the Ninety-second and to the seven succeeding Congresses (January 3, 1971-January 3, 1987); chairman, Committee on Small Business (Ninety-seventh, Ninety-eighth, and Ninety-ninth Congresses); was not a candidate for reelection in 1986; died on May 28, 2007, in Baltimore, Maryland. Hundreds came together Monday night to honor one of Baltimore's greatest political leaders. A memorial service was held for Parren Mitchell, a civil rights icon who broke barriers as Maryland's first African American congressman. ABC2 news Linda So reports on the legacy he leaves behind. Parren Mitchell grew up just blocks from Saint James Church in West Baltimore. A humble beginning to a monumental life. Former Congressional Delegate Walter Fauntleroy says, "Ii remember him as one of the founding members of the Congressional Black Caucus." As the state's first African American congressman, Mitchell paved the way for many other politicians, including former Baltimore Mayor Kurt Schmoke. "When I first ran for office in 1982, I didn't know beans about what to do, how to go around the community. Parren just grabbed me by the hand and started me door to door." Mitchell broke racial barriers becoming the first black student to attend the University of Maryland. Even as he moved up the ranks as a prominent politician, family members say he never forgot about the people he represented. His great nephew Clarence Mitchell the fourth says, "The smallest person in the room if they were being harmed he would stand up and fight for them." Keiffer Mitchell, also a great nephew, and Baltimore City Councilman says, "He was always just uncle Parren. He was a U.S. congressman, but he was uncle Parren who came to college to visit you and sit in your dorm room." Now as his family prepares for his funeral, they plan to stay true to what Mitchell stood for, welcoming people from all walks of life. His nephew Jimmy Gittings says, "From the common man up to the U.S. senator, everyone is welcome and that is the way Parren would want it." The family will receive guests on Tuesday at Saint James Episcopal Church starting at 10 am. The funeral is at noon. Mitchell will be buried at Arlington National Cemetery. Former Congressman Parren J. Mitchell, the founder of the Congressional Black Caucus and a champion of civil rights, left behind two sprawling families _ his relatives, and those who carried on his legacy. Both of them _ the relatives on the right side of the aisle, the politicians on the left _ packed St. James' Episcopal Church on Tuesday to remember Maryland's first black congressman, who died May 28 at age 85. "With the passing of Parren Mitchell, our nation has lost one of its most passionate champions of justice and equality," House Speaker Nancy Pelosi said. The service, nearly four hours long, including rousing tributes to Mitchell's advocacy for the economically disadvantaged. Speakers included Maryland Senators Barbara Mikulski and Ben Cardin; Governor Martin O'Malley; Representative John Conyers, D-Michigan; Baltimore Mayor Sheila Dixon; and former Congressman and NAACP president Kweisi Mfume, who took over Mitchell's seat in 1987. Most mentioned Mitchell's work on behalf of minority businesses. He fought for legislation requiring local governments to set aside 10 percent of federal grants to hire minority contractors, and he led the House Small Business Committee. "He wanted people in the minority community not just to get jobs, but to create jobs," Pelosi said. Mitchell was part of a family dubbed the "black Kennedys" for their prominence in politics and civil rights. 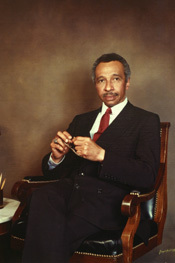 His brother, Clarence M. Mitchell Jr., helped shepherd the major civil rights legislation of the late 1950s and 1960s as the NAACP's principal lobbyist, and was known as the 101st senator. Clarence Mitchell's wife, Juanita Jackson Mitchell, was the longtime head and legal counsel of the Maryland NAACP. Born in 1922, Parren Mitchell was wounded in Italy during World War II and awarded a Purple Heart. After the war, he graduated from Morgan State College (now Morgan State University) and, after a successful lawsuit, became the first black student to enroll in graduate courses at the University of Maryland, College Park, where he earned a master's degree. He unsuccessfully ran for Congress in 1968, then tried again in 1970 and narrowly defeated Samuel N. Friedel in the Democratic primary. He served eight terms before stepping down in 1986. "Whenever people tell me their votes don't count, I tell them Parren Mitchell got elected by 38 votes," former Sen. Paul Sarbanes said. Clarence Mitchell Jr.'s work in Washington often kept him away from his family, and Parren Mitchell became a surrogate father to many of his nieces and nephews, said one of them, former state senator Clarence M. Mitchell III. "My fondest memory is him teaching me how to drive," Clarence Mitchell III said. "When my father couldn't be there, Parren was here for us." Rep. Elijah Cummings, who has represented Mitchell's old district since 1996, noted that the congressman practically provided his own epitaph _ the rhyming verse, attributed to Benjamin Mays, that he often used to end speeches. "I only have a minute _ 60 seconds in it," Mitchell would say. "Forced upon me I did not choose it, but I know that I must use it. Suffer if I lose it, give account if I abuse it. Only a tiny little minute, but eternity is in it." Parren J. Mitchell, 85, a Baltimore civil rights activist who became Maryland's first black member of Congress in 1970, died May 28 of complications from pneumonia at Greater Baltimore Medical Center. He had been living in a nursing home since a series of strokes several years ago. A founding member of the Congressional Black Caucus and chairman of the House Small Business Committee, Mitchell worked for years to ensure minority participation in contracts let under federal public works programs. He was an original sponsor of legislation approved in 1977 guaranteeing minority contractors a share in public works spending. He also sponsored an amendment to the 1982 Surface Transportation Assistance Act requiring that at least 10 percent of the funds provided under the law go to small businesses owned and controlled by socially and economically disadvantaged people. He considered these and related economic measures the second phase of the civil rights movement. A trim 5-foot-5, he was known as "the Little General" during his tenure as chairman of the Congressional Black Caucus, a tribute to his ability to organize his forces quickly. During the Carter administration, he urged the government to oppose South Africa's apartheid regime. In 1985, Senator Richard G. Lugar (R-Indiana), then chairman of the Senate Foreign Relations Committee, said it was Mitchell's impassioned plea for sanctions against South Africa that persuaded him to accept a tougher measure than the Senate originally backed. He also served on the Banking, Finance and Urban Affairs Committee, considered in those days to be the legislative guardian of minority business. Those who worked with Mitchell said he was basically a shy person and invariably courteous in one-on-one settings, but he could be fiery and outspoken when he encountered what he considered injustice. In 1968, when Maryland Governor Spiro T. Agnew called together a group of black leaders in response to rioting in Maryland cities, Mitchell stormed out as the governor began berating them. During the 1980 presidential campaign, Mitchell called Ronald Reagan a "clear and present danger to black Americans." Two years later, he blamed the president for rising unemployment. After two nights of watching "Roots," the 1977 television miniseries tracing author Alex Haley's family from slavery to freedom, he angrily turned off the TV. "If I had met any of my white friends, I would have lashed out at them from a vortex of primeval emotion," he said. "Parren's emotion is the emotion of a Patrick Henry. He didn't say give me liberty later," his sister-in-law, Juanita Jackson Mitchell, told The Washington Post in 1977. "Parren is just one of God's angry men." Representative Elijah E. Cummings (D-Maryland) described Mitchell as "a true servant leader, never concerning himself about fame or fortune but, rather, devoting himself entirely to uplifting the people he represented." Cummings, who occupies the 7th District seat once held by Mitchell, sponsored legislation last year that named a Baltimore post office in the veteran congressman's honor. Parren James Mitchell was born in Baltimore. In a 1985 interview with The Post, he recalled being about 12 when his older brother, Clarence M. Mitchell Jr., burst into the house at dinnertime, violently ill. Working as a reporter for the Baltimore Afro-American newspaper, he had just seen the body of a black man who had been lynched in Somerset County. It was a troubling initiation into a racist culture frustratingly familiar to African American residents of the almost-Southern city of Baltimore. It was a culture that the Mitchell family refused to accept. Mitchell's brother, whom he called "my big brother hero," would become director of the Washington office of the NAACP from 1950 to 1979. His sister-in-law was a prominent civil rights lawyer in Baltimore. At an early age, Mitchell was walking picket lines with his brother outside segregated department stores, theaters and an amusement park. He graduated from Baltimore's Frederick Douglass High School in 1940 and served in the Army during World War II. He was awarded a Purple Heart for wounds he suffered in Italy. He received an undergraduate degree in 1950 from what would become Morgan State University and applied for admission to graduate school at the University of Maryland in College Park. The university president turned him down, ruling that it was "inadvisable" for blacks to attend College Park. He proposed that Mitchell attend a separate graduate program in Baltimore. Mitchell sued and won, thus becoming the first African American graduate student at College Park. He received his master's degree in sociology in 1952. He worked as a probation officer and head of Baltimore's antipoverty program before becoming an assistant professor of sociology at Morgan State, where he also directed the school's Urban Studies Institute. He came to public prominence in 1968 when he helped mediate rioting that broke out in Baltimore after the assassination of the Rev. Martin Luther King Jr. in Memphis. He ran for Congress in 1968 but lost in the Democratic primary. He ran again in 1970, defeating a veteran incumbent by just 38 votes in the primary. Considered too liberal by some House colleagues and too blunt by others, he never lost his outrage on behalf of the poor and minorities. In 1977, the minority set-aside programs he so proudly championed came under attack in Congress when it was revealed that many contracts that were supposed to be set aside for minority business owners were going to African Americans fronting for white contractors. In one hearing, Mitchell scathingly denounced "these white knaves and their black Judas Iscariots" for undermining the program. In the mid-1980s, members of Mitchell's family besmirched the ideals in which he believed. Two nephews who were then state senators -- Clarence M. Mitchell III and his brother, Michael B. Mitchell -- were convicted in federal court in 1987 of accepting $50,000 from the Wedtech Corp. to obstruct a House Small Business Committee investigation of the Bronx-based defense contractor. Although Mitchell headed the committee at the time, he was not implicated in the scandal. His nephews were sentenced to 2 1/2 years in prison. Mitchell retired after eight terms, expressing frustration with the Democratic Party that it was "trying to out-Republican the Republicans." Congress, he said, "has lost its sense of compassion" and was chipping away at the hard-won gains of the civil rights movement. In 1986, he joined the Democratic gubernatorial ticket of Attorney General Stephen H. Sachs. Baltimore Mayor William Donald Schaefer easily defeated Sachs in the primary. In retirement, he continued to work three days a week on social and political issues and served as chairman of the nonprofit Minority Business Enterprise Legal Defense and Education Fund. There are no immediate survivors. Lieuenant Mitchell will be buried with full military honors in Arlington National Cemetery on 10 July 2007.